Laid down at corners to mounting paper. Chaffee French Series D. New York Public Library Digital Collections: Mme. Courtin (NYPL image ID 5095407); Melle. Fanny (NYPL image ID 1515914); Bigottini (NYPL image ID 5073713). Milon (?1766-?1849) was a French ballet dancer, choreographer, and ballet master. He produced highly successful ballets including Pygmalion (starring his young sister-in-law, Émilie Bigottini) and Héro et Léandre, after which he was named assistant ballet master to Pierre Gardel... "Another ballet that made a favorable impression several years later was Clari... with Bigottini and Albert in the principal roles. 'It was a typical example of pre-Romantic ballet,' said Ivor Guest (1980), 'with characters drawn from everyday life and its action evincing a rather naive sympathy with the common people.' " Monique Babsky in the International Encyclopedia of Dance, Vol. 4, pp. 422-423. He was also considered the last "grand professeur" of pantomime at the Opéra." Wikipedia. Bemerkungen auf Reisen gesammelt im Jahr 1803. 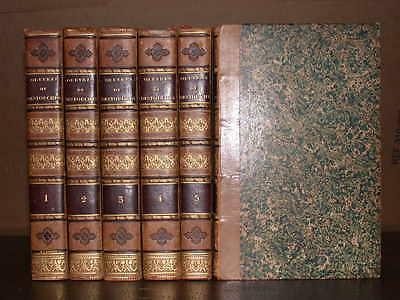 Edinburgh: Archibald Constable and Co, 1820. First edition. Hardcover. Very Good. 8vo. 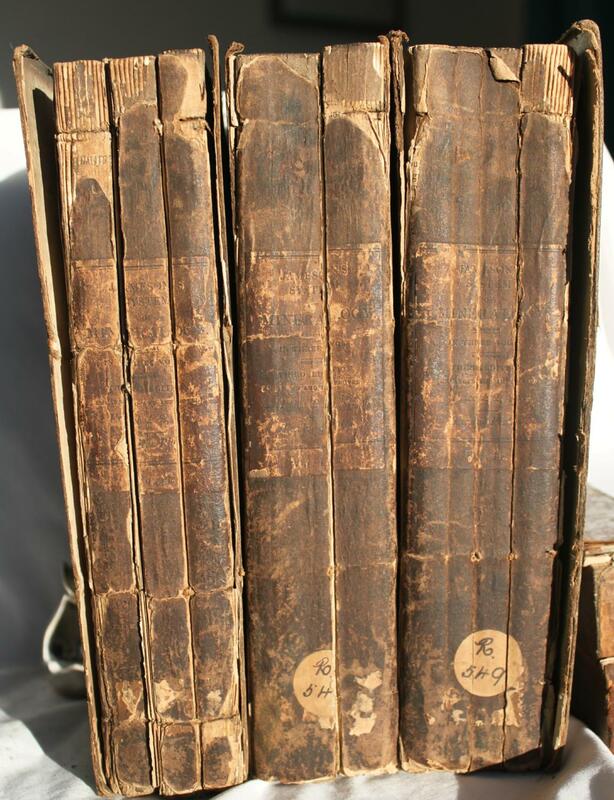 3 volumes: 298  pp. ; 327 pp. ; 371 pp. 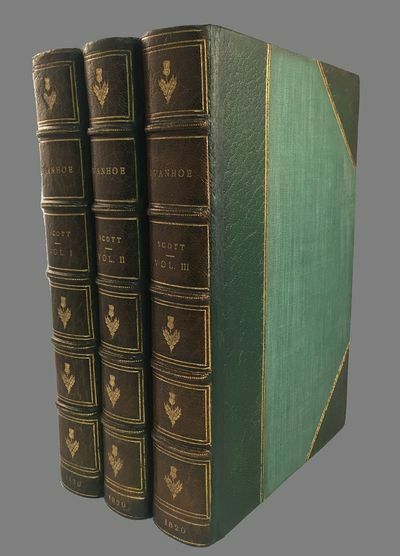 The three volumes are quarter-bound in green morocco over textured green cloth with twin gold rules on the borders on both front and rear boards, spine with 5 gilt raised bands and gilt design and lettering, marbled endpapers, all edges gilt. Bound by Riviere & Son with later professional strengthening to the joints. 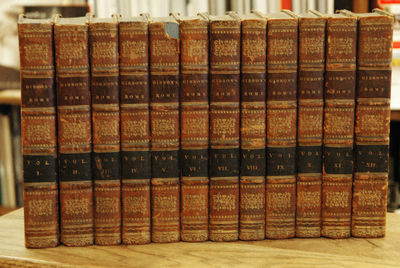 Lacking the half-titles in volume 1 and volume 2, advertisements at the end of volume 3 are not bound in (fly titles present in all 3 volumes). Volumes 2 and 3 correspond to the first issue of the first edition as specified in Todd & Bowden. Volume 1 has the pagination error indicative of the first edition and 'toilsome' at xv.3 which is indicative of the first issue; however, the figures called for on the sheets vary between what is specified for the first and second issue (sheets A, F, I-P, and S-Y correspond to what is called for in the first issue, sheets B-E and G correspond to what is called for in the second issue, and sheets Q and R do not correspond to any in Todd & Bowden). An attractive set of Scott's best known novel, a historical romance set in 12th century England. Worthington (8); Todd & Bowden 140Aa. The green leather has mellowed to a rich brown on the spines, a few traces of rubbing and trivial wear to the boards, the vast majority of the leaves are quite clean (a few have hints of foxing). 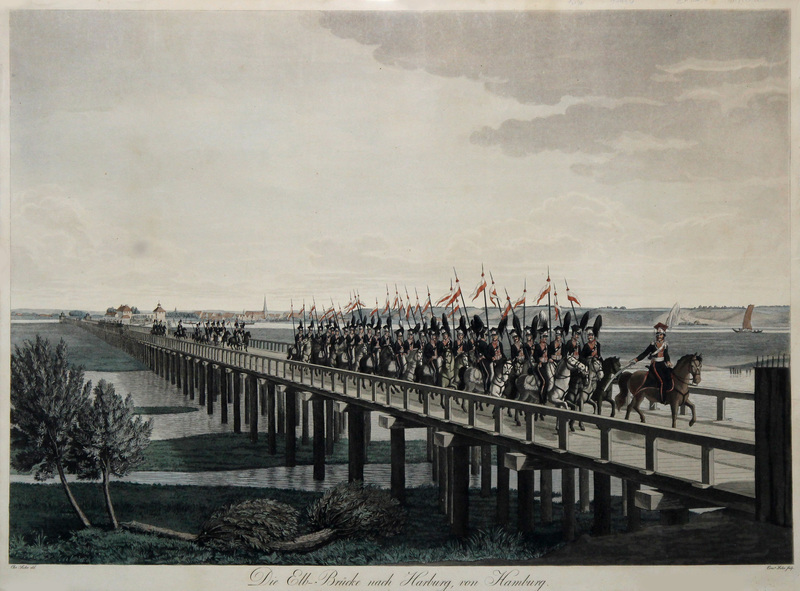 TA., Elbbrücke bei Harburg, "Die Elb-Brücke nach Harburg, von Hamburg .". - altkol. Aquatinta v. Cornelius Suhr n. Christoph Suhr, um 1820, 43,5 x 61,5 Thieme - Becker, Bd. 32, S. 279 mit Erwähnung dieses Blattes. Sehr seltene Ansicht der alten Holzbrücke zwischen Hamburg und Harburg, zugleich eine der größten Arbeiten von C. Suhr. Auf der Brücke zahlr. Soldaten, im Hintergrund die Stadt Harburg. - Leider fehlt der untere Teil der Legende. PRATICA DI ARITMETICA DIVISA IN LIBRI TRE NE' QUALI C'INSEGNA CON LA FACILITA' POSSIBILE LA PRATICA MERCANTILE. Das neue Schauspielhaus in Berlin. - teilweise altkoloriert ( die Personen, Pferde und Kutschen), Aquatinta ( in Sepia ) v. Prof. Jügel n. Schinkel b. Wittich in Berlin, dat. 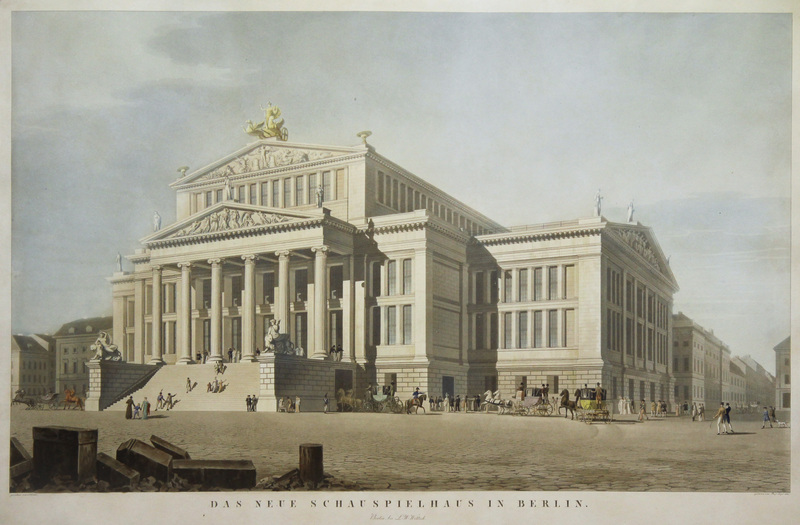 1820, 48,5 x 74,5 Ernst, Berlin in der Druckgraphik, Schinkel. Nr. 4; Kiewitz 1121. - Blick zum Schauspielhaus von der Markgrafenstraße aus, rechts Blick in die Jägerstraße. 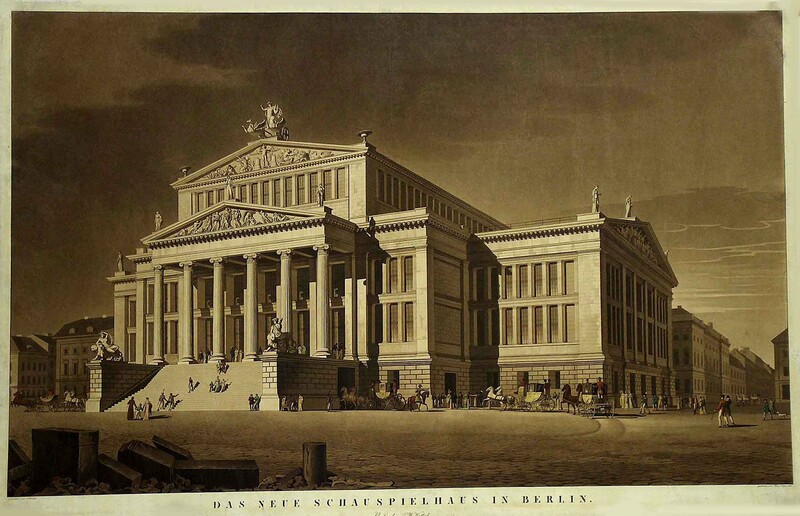 Dargestellt ist das 1818 bis 1821 nach Plänen von Karl Friedrich von Schinkel erbaute Schauspielhaus. Mit zahlreichen Kutschen, die zum Schauspielhaus vorfahren. - Bei vorliegender Ansicht handelt es sich um eine der frühesten gedruckten Ansichten des Schauspielhauses. - Mit restaurierten Einrissen. \"Die Baerenhöhle bei Ober-Ammergau\". Blick aus der Höhle auf Bergkegel mit Gipfelkreuz, vorne drei Wanderer. Artist: Vernet Antoine Charles Horace ( Carl) ca ; date: ca1820 - - technic: Lithography; - colorit: original colored; - condition: Fold; - size (in cm): 33,5 x 34; - description: Decorative representation of a persian horse. ; - vita of the artist: Vernet drew horse with the forms he had learnt from nature in stables and riding-schools. His hunting-pieces, races, landscapes, and work as a lithographer were also very popular. In addition to being a painter and lithographer, Carle Vernet was an avid horseman. Just days before his death at the age of seventy-eight, he was seen racing as if he were a sprightly young man. Schwerin. - Ansicht. - "Schwerin von der Artillerie Wache". Gesamtans. 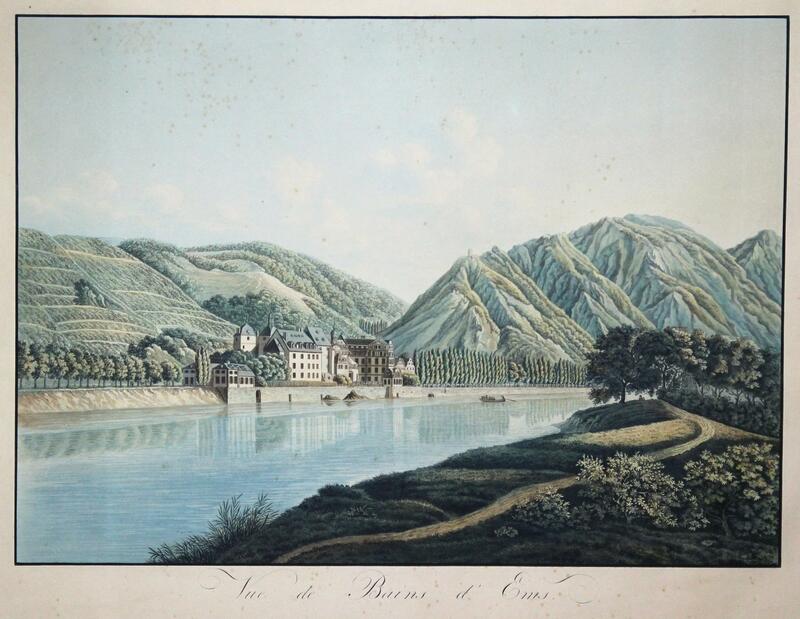 "Vue de Bains d' Ems". - Baudouin frères, Paris 1820, 8,5x14cm, relié. - Prima edizione separata. Bound in piena pelle di pecora marrone chiaro, liscia dorata dorso decorato con due tamburato e decorata così come i modelli dorati tipografici, tappi superiori leggermente strofinato, marocco titolo pezzo di ciliegio, guardie e contreplats ciotola di carta, i bordi gialli, vincolante tempo. Una nota biografica sull'autore incollato accanto alla pagina occhietto, foxing scarse e aneddotica. Nizza copia. - [FRENCH VERSION FOLLOWS] Première édition séparée. Reliure en pleine basane havane, dos lisse orné de deux doubles caissons dorés et décorés ainsi que de motifs typographiques dorés, coiffes supérieures légèrement frottées, pièce de titre de maroquin cerise, gardes et contreplats de papier à la cuve, tranches jaunes, reliure de l'époque. Une note biographique concernant l'auteur encollée en regard de la page de faux-titre, rares et anecdotiques rousseurs. Agréable exemplaire. FLORENZ., "Firenze". Links der Campanile di Giotto, im Mittelpunkt der Dom, davor hübsche Staffage mit Kutschen, Reitern und vielen Spaziergängern. Dublin. Printed for the Author. 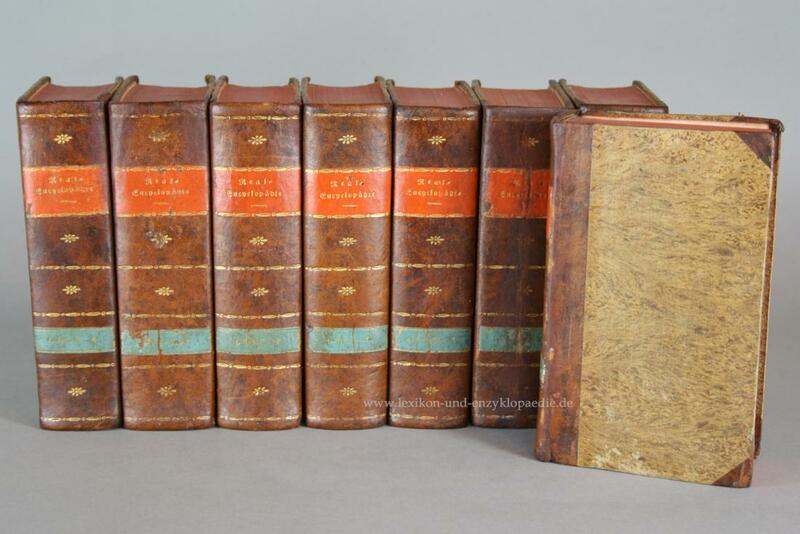 1820.. 1st Edition. Hardcover. 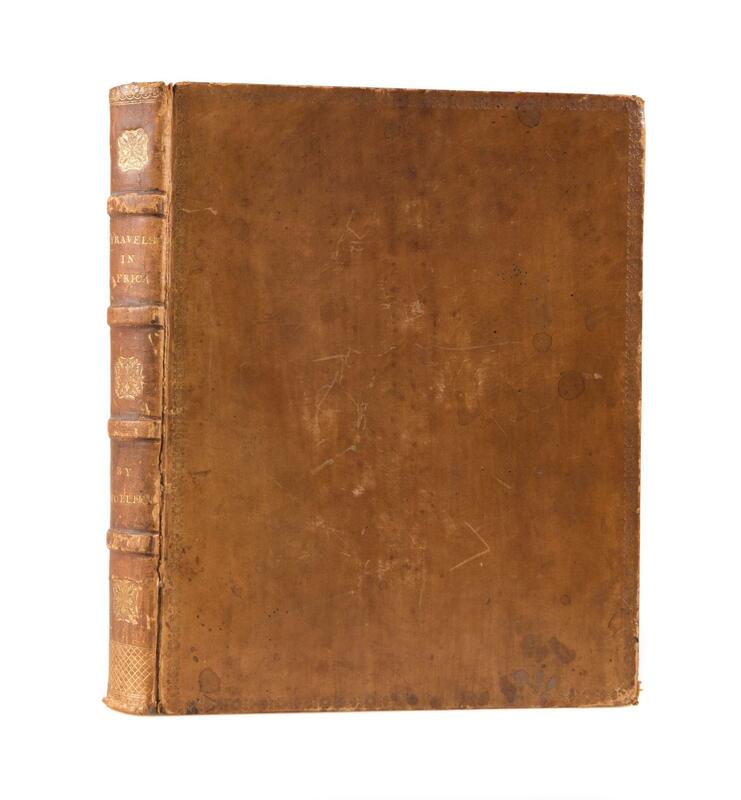 Book folio, 31.5cm, first (sole) edition, [vi],478,xcvii,p., Large Pager Copy, with 7 steel engraved plates (inc. cathedral view, plan/map, interior, ancients, full portrait of Swift, monument), appendices & additional notes, bound in full contemporary calf, expertly rebacked, raised bands, blind decorations in the panels, crushed black morocco label gilt, blind decorated borders on the boards, blind inner dentelles, marbled endpapers and edges, some repaired peeling on the boards, very good to fine copy, rare Not in Bradshaw. Mason, who was born at Powerscourt, 1778-1858, was an author, poet and librarian of the King's Inns. He became, through his concern with Protestant evangelization, interested in the Irish language and was instrumental in founding the first chair of Irish at T.C.D., and in 1830 he published an Irish Grammar. 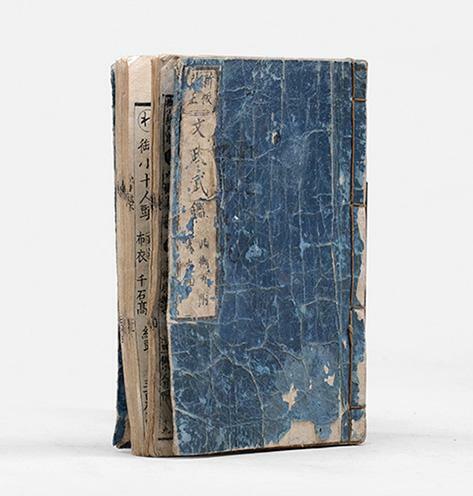 In his life time he formed a great collection of rare books and manuscripts. Published at his own expensive, this is a great history and a fine work but it received little support. His plans for a companion work on Christ Church and History of Dublin, did not materialize. .
London: Printed for Taylor and Hessey,, 1820. Duodecimo (177 x 104 mm). 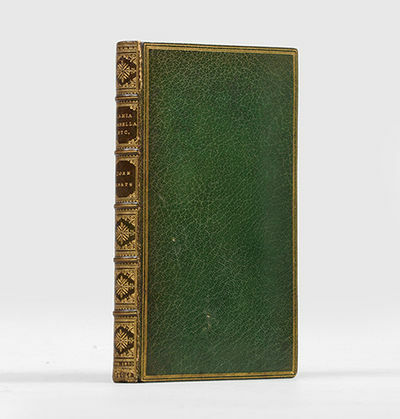 Bound by Bedford in 19th-century green morocco, spine lettered and decorated in gilt, boards triple-ruled in gilt, elaborate gilt dentelles, vellum doublures and endpapers, top edge gilt. With the half-title and publisher's advertisement leaf, and the 6-page publisher's catalogue to the rear, the latest date being June 1820. Light wear to spine ends and joints, some minor scuffing to front board, overall an excellent copy with bright, fresh contents. First edition of keats's third and final book, a superb copy with the half-title, advertisements, and untrimmed in a fine Bedford binding. This was the last book published in Keats's lifetime, about which he had "low hopes, though not spirits... this shall be my last trial; not succeeding, I shall try what I can do in the apothecary line". Though Keats did not live to see his fame confirmed, this last collection is his greatest single volume, containing the magnificent series of odes on which his reputation now rests, as well as his longer narrative poems  two medieval romances: the chilling "Isabella or the Pot of Basil" and the gothic romance "The Eve of St Agnes"; and two mythological fantasies: the weird "Lamia" and the ambitious, Miltonic fragment "Hyperion". 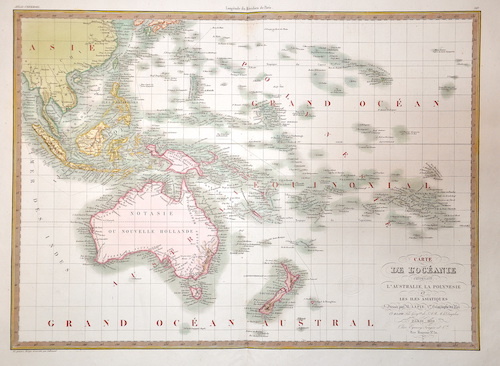 Artist: Lapie Alexandre Emile ca ; issued in: Paris; date: ca1820 - - technic: Copper print; - colorit: colored; - condition: Very good; - size (in cm): 40 x 55; - description: map of Oceania; - vita of the artist: Pierre M. Lapie (1779 ? 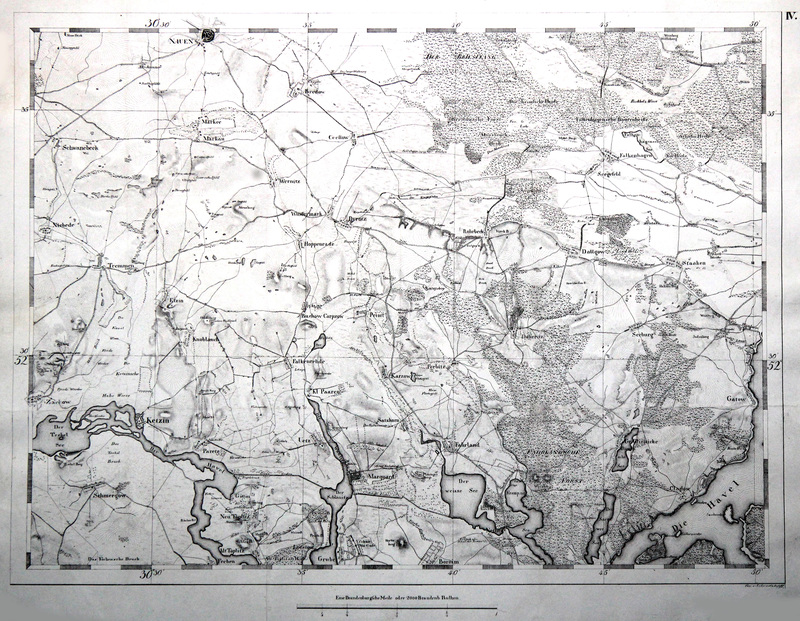 1850) was a French cartographer and engraver. He was the father of cartographer Alexandre Emile Lapie. Lapie was a Colonel in the French army, where he worked in the corps of topographical engineers. Lapie worked closely with his son and published works together and individually. The work of Lapie and his son was influential on German commercial map makers in the 19th century. EL ACUEDUCTO Y OTRAS ANTIGÚEDADES DE SEGOVIA. (Edición original). - Madrid, Imprenta de Miguel de Burgos, 1820, 21x30, XVII-254 págs. (en realidad 260 pues hay un error de paginación de imprenta en todas las obras). 5 láminas, 2 de ellas, desplegables, son del acueducto dibujadas por Victor Villanueva en 1819. Lleva añadido por su antiguo propietario un prospecto de la Ilustracion Española de 1875 con grabado desplegable del acueducto. Perfecto estado de conservación, ejemplar impecable, sin nada de óxido ni manchas. Encuadernado en holandesa de época con la lomera en piel con nervios. 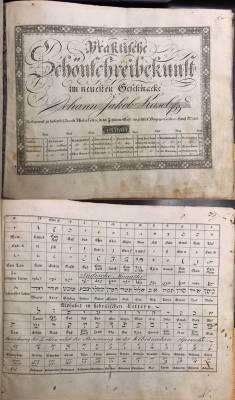 (Obra de referencia para el conocimiento del acueducto segoviano que incluye documentos sobre la restauración del acueducto de los papeles originales del archivo del archivo del monasterio del Parral, orden de S. Gerónimo de la ciudad de Segovia y otros documentos sobre otras antigüedades segovianas). (57459). TA, Schloßplatz vom Brühl'schen Garten, "Dresden von der grossen Treppe des Brühlschen Gartens aus. 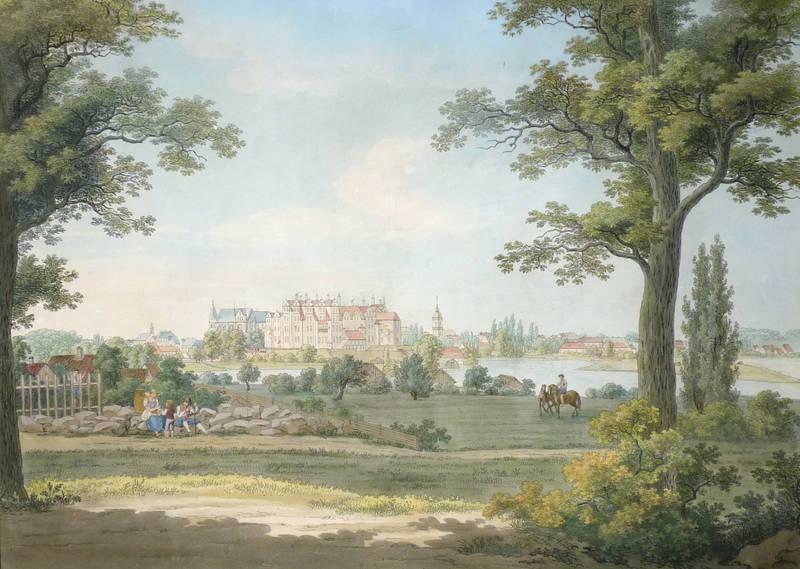 - Vue de Dresde, prise de la grande Tersse du jardin de Brühl". - Antique drawing, untitled. 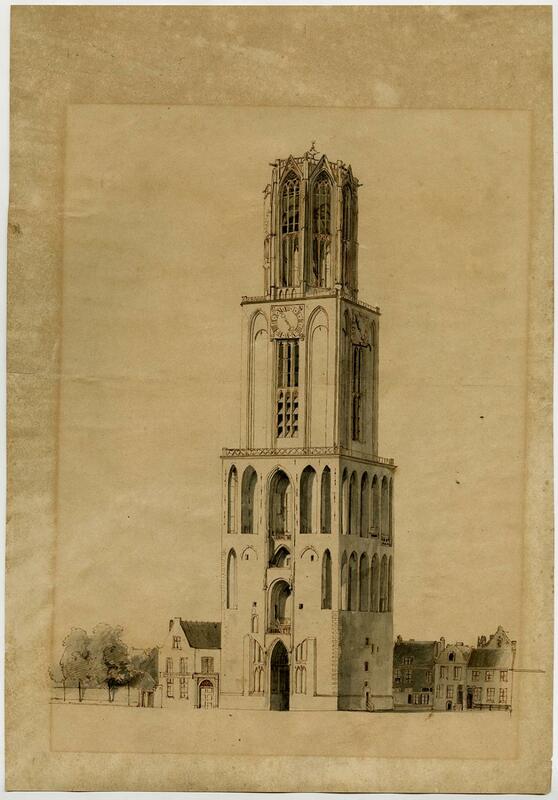 Original drawing of the Domtoren, the tower of the Utrecht Cathedral. pen and washed ink drawing on wove paper. 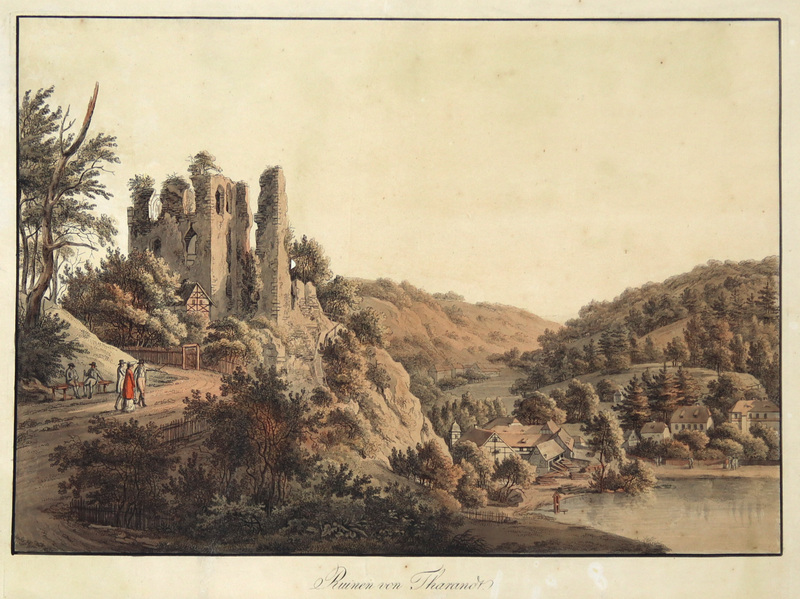 Description: To be dated c. 1820.Artists and Engravers: Anonymous, Dutch school. Condition: Good, given age. Attached to thin carrier sheet. Overall browning and ghosting from previous matting. Small tear in left margin. Light creasing. General age-related toning and/or occasional minor defects from handling. Please study scan carefully. Storage location: E32-20 The overall size is ca. 11.6 x 16.5 inch. The image size is ca. 9.8 x 12 inch. The overall size is ca. 29.5 x 42 cm. The image size is ca. 25 x 30.5 cm. - Antique drawing, untitled. Landscape with a windmill and several structures and figures. Drawing in East India ink on wove paper. Description: Source unknown, to be determined.Artists and Engravers: Made by 'Jordanus Hoorn' after own design. 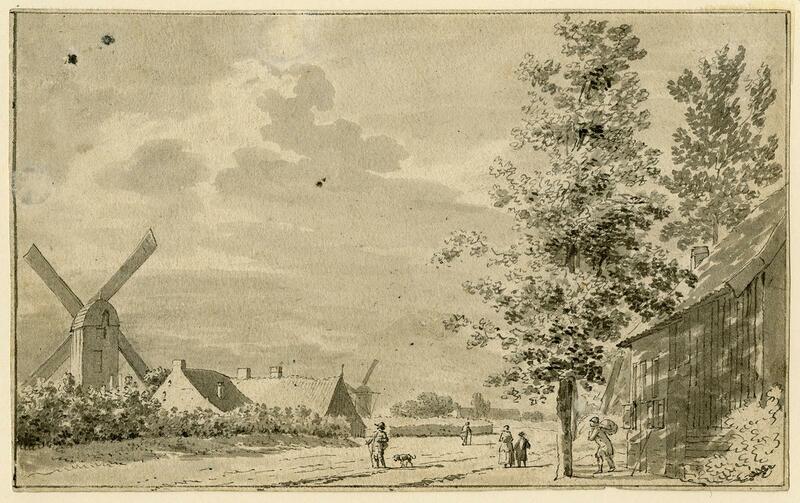 Jordanus Hoorn (1753-1833) worked as landscape artist. He originated from Amersfoort. Condition: Very good, given age. Margins cropped close to the image edge. Remains of attachment to carrier to the rear. Two small stains in the top left corner and a tiny stain in the middle of the image. General age-related toning and/or occasional minor defects from handling. Please study scan carefully. Storage location: Q1-051 JvO The overall size is ca. 8.2 x 5.1 inch. The image size is ca. 8.2 x 5.1 inch. The overall size is ca. 20.8 x 13 cm. The image size is ca. 20.8 x 13 cm. 1820. London, 1820. 22-1/2" x 17-1/2" broadside. London, 1820. 22-1/2" x 17-1/2" broadside. 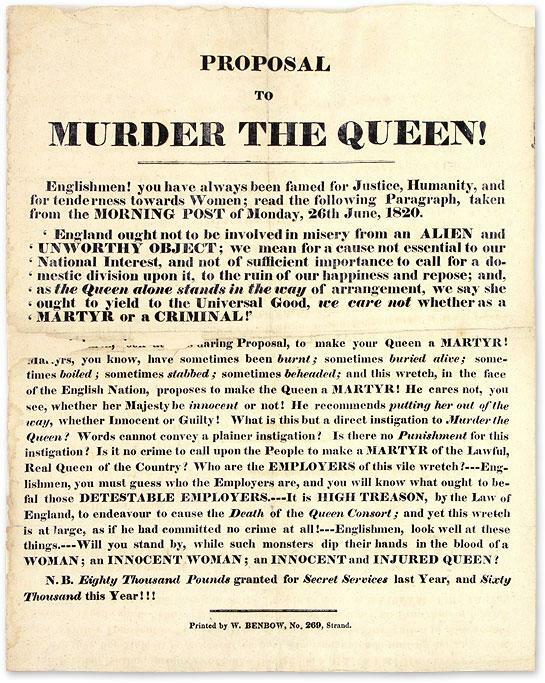 A Fervent Broadside Defending the Spurned Queen of King George IV [Broadside]. [Caroline of Brunswick (1768-1821)]. [Pains and Penalties Bill]. Proposal to Murder the Queen! London: Printed by W. Benbow, . 22-1/2" x 17-1/2" broadside. Text in single column below headline, item mounted to archival paper. Light toning, some edgewear with a few small chips, one vertical and one horizontal fold line, some loss to legibility of about five words along horizontal fold. $1,500. * The repudiation of Queen Caroline by King George IV was one of the most sensational events in English history. Estranged soon after their marriage, Caroline was eventually banished after the birth of their daughter, Princess Charlotte Augusta. In 1814 Caroline moved to Europe. In 1820 her husband's accession to the throne brought her back to Britain. The King asked his ministers to get rid of her. After she refused a monetary offer, the Earl of Liverpool introduced The Pains and Penalties Bill to the House of Lords in July 1820 in order to strip Caroline of the title of Queen Consort and dissolve her marriage. (The bill alleged that Caroline had an affair with a servant, Bartolomeo Bergami, while in Italy.) The bill was approved by the House of Lords, but it was not submitted to the House of Commons, where it would have been defeated. Despite the King's best attempts, Caroline remained a popular favorite. Indeed, her popularity increased during the trial. Although she prevailed, she fell ill and died shortly after the coronation of George IV. She was certain that she was poisoned by one of the King's agents. The trial inspired numerous books, pamphlets and ephemera, such as this anonymous broadside. One of many publications that supported Caroline's cause, it takes issue with a statement against Caroline that appeared in a newspaper on June 26, 1820. Its author said she was an "alien and unworthy object" who needs to be dismissed, either as a "martyr or a criminal." The broadside claims this statement is essentially a call to have her executed, since that is the common fate of martyrs and often the fate of deposed royalty. Litho. - Karte, ohne Titel, v. (Gur ?) v. Schwartzkopff. 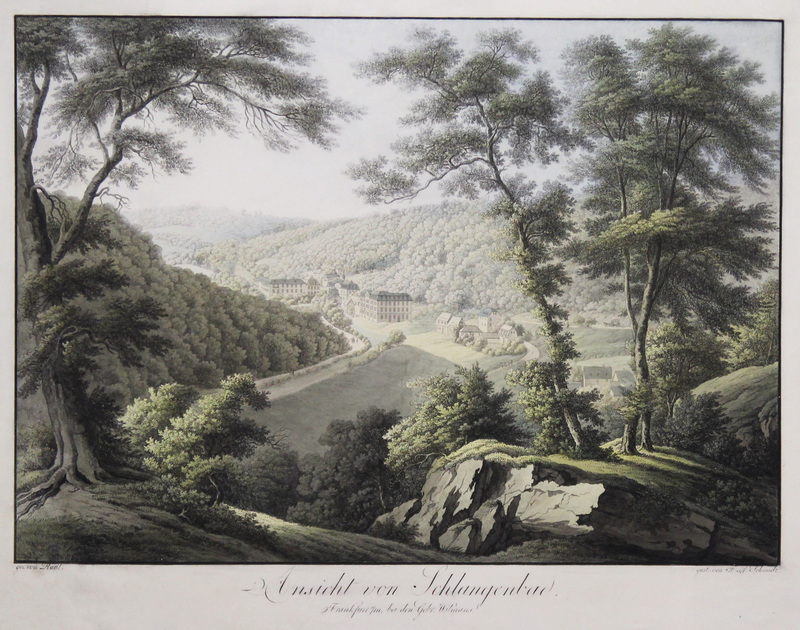 Rudolph Ackermann, dated September 1, London 1820 - Engraved view measuring 230 x 335mm. (plate size), early handcolouring. 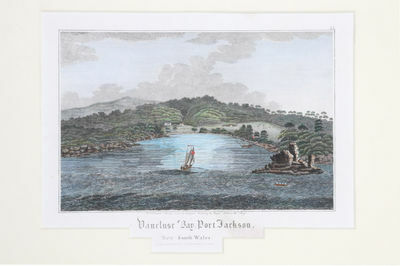 An early engraved view of Sydney Cove, itself the extraordinary outcome of the fruitful relationship between two convict engravers, Walter Preston and Joseph Lycett, and the artistically talented army officer Major James Wallis.This plate forms the frontispiece of Wallis' fine album of Australian views titled An Historical Account of the Colony of New South Wales published by Ackermann in London in 1821. 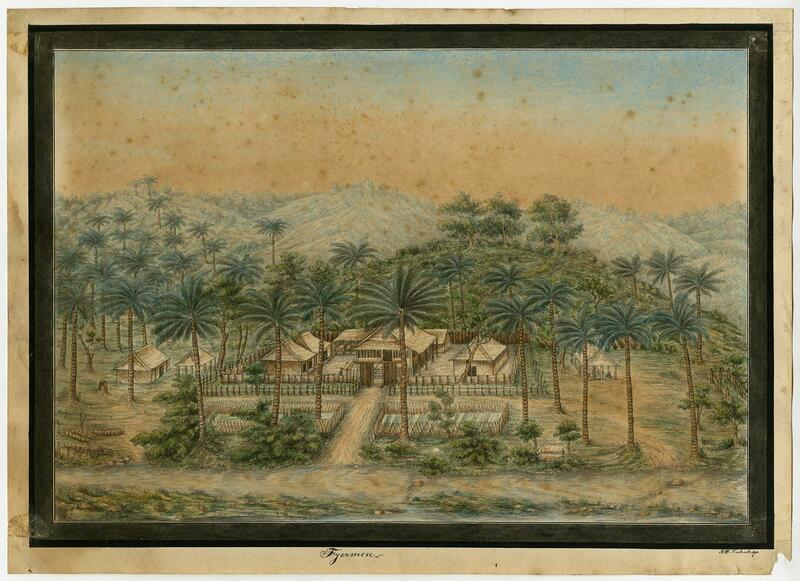 The plate was engraved by the convict artist Walter Preston whose considerable talents came to the attention of Major Wallis, then commander of the convict settlement at Newcastle. 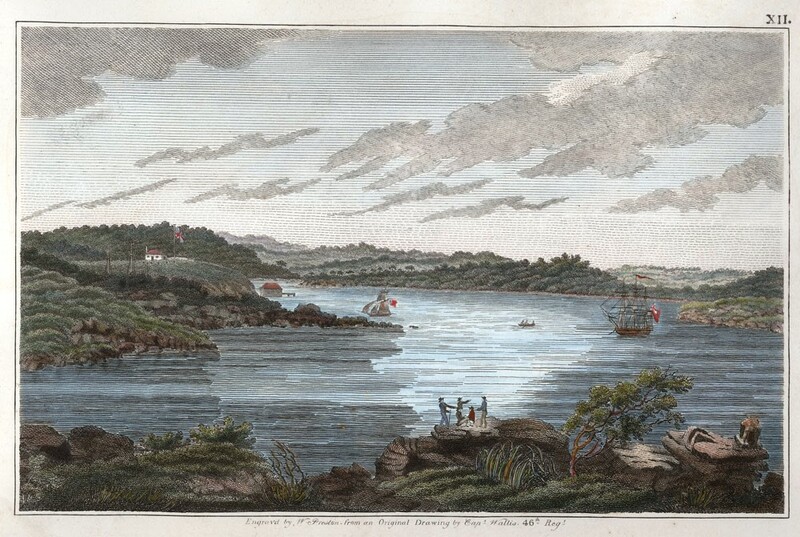 At the time, Newcastle enjoyed a fearsome reputation for as a place for secondary punishment and was described by a contemporary officer as 'the Hell of New South Wales'.For many years the attribution of Wallis as the artist of the views in An Historical Account of the Colony of New South Wales was a matter of historical conjecture (the implication being that he had appropriated the work of Preston and Lycett). However, the recent revelation of original watercolour material by Wallis establishes him as the artist. Not that this fact diminishes the achievement of the convict engravers: Preston was tasked with working upon the only copper sheets available, manufactured for sheathing the hulls of ships, a difficult material softer than standard engraving copper.Ultimately, both Preston and Lycett were pardoned by Macquarie on Wallis' recommendation, in no small part because of their work on this book. When Wallis departed Australia in 1819 he took the plates with him to London where this book was published by Ackermann, complete with an introductory history of the colony and a map of Port Macquarie by the surveyor John Oxley. Small closed tear affects upper blank margin (image entirely unaffected, now expertly repaired); very good. 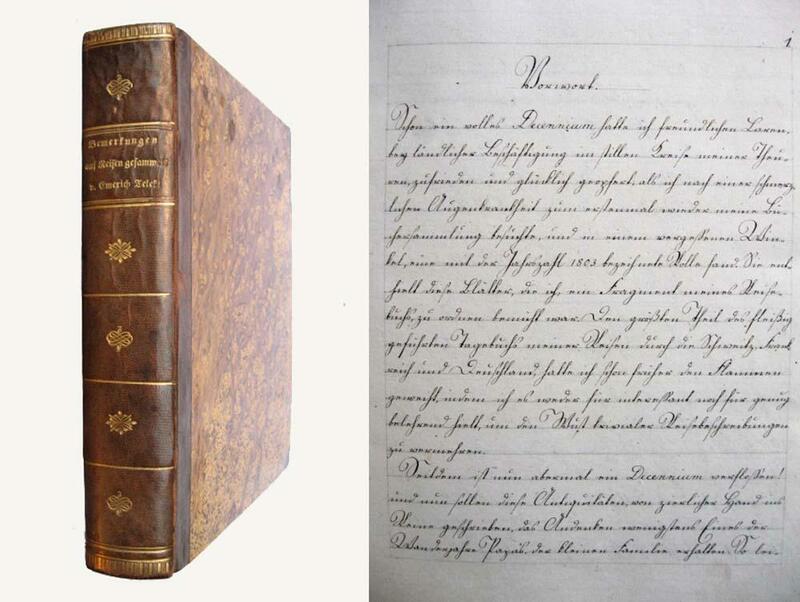 London: Rudolph Ackermann, 1820. laid down on fine tissue, tear repaired. Handcoloured engraving, 230 x 335 (plate size), mounted. Very rare and attractive view of Vaucluse, from Wallis's Historical Account of the Colony. 1820 - London, 1820. 22-1/2" x 17-1/2" broadside. 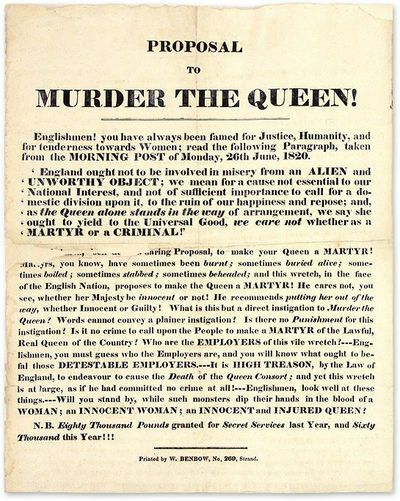 A Fervent Broadside Defending the Spurned Queen of King George IV [Broadside]. [Caroline of Brunswick (1768-1821)]. [Pains and Penalties Bill]. Proposal to Murder the Queen! 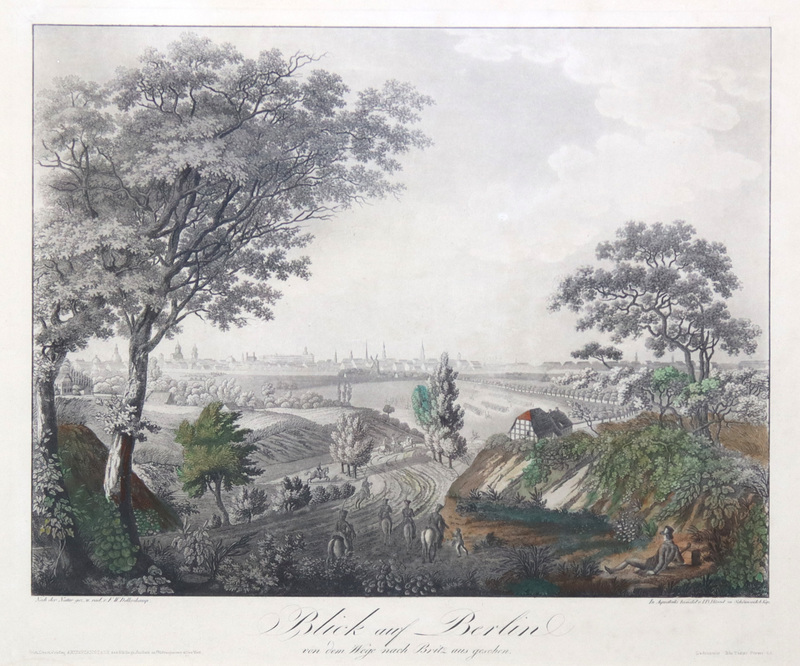 London: Printed by W. Benbow, . 22-1/2" x 17-1/2" broadside. Text in single column below headline, item mounted to archival paper. Light toning, some edgewear with a few small chips, one vertical and one horizontal fold line, some loss to legibility of about five words along horizontal fold. $1,500. * The repudiation of Queen Caroline by King George IV was one of the most sensational events in English history. Estranged soon after their marriage, Caroline was eventually banished after the birth of their daughter, Princess Charlotte Augusta. In 1814 Caroline moved to Europe. In 1820 her husband's accession to the throne brought her back to Britain. The King asked his ministers to get rid of her. After she refused a monetary offer, the Earl of Liverpool introduced The Pains and Penalties Bill to the House of Lords in July 1820 in order to strip Caroline of the title of Queen Consort and dissolve her marriage. (The bill alleged that Caroline had an affair with a servant, Bartolomeo Bergami, while in Italy.) The bill was approved by the House of Lords, but it was not submitted to the House of Commons, where it would have been defeated. Despite the King's best attempts, Caroline remained a popular favorite. Indeed, her popularity increased during the trial. Although she prevailed, she fell ill and died shortly after the coronation of George IV. She was certain that she was poisoned by one of the King's agents. 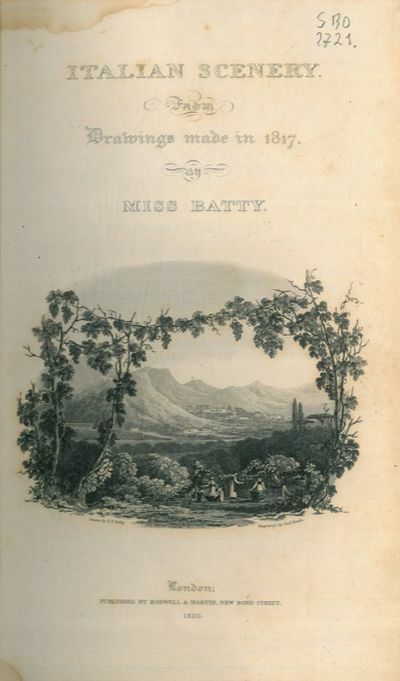 The trial inspired numerous books, pamphlets and ephemera, such as this anonymous broadside. One of many publications that supported Caroline's cause, it takes issue with a statement against Caroline that appeared in a newspaper on June 26, 1820. Its author said she was an "alien and unworthy object" who needs to be dismissed, either as a "martyr or a criminal." The broadside claims this statement is essentially a call to have her executed, since that is the common fate of martyrs and often the fate of deposed royalty. 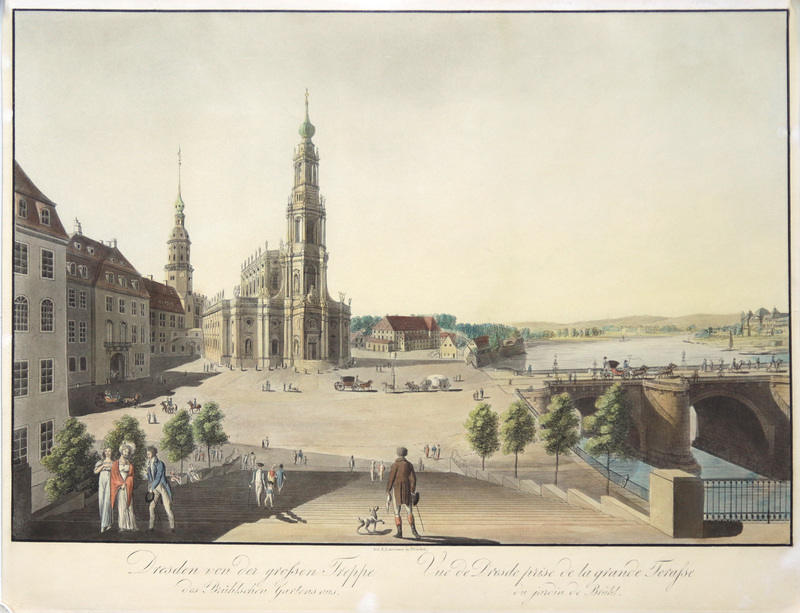 [Prag], Jacob Micheletto, [um 1820?]. - o. Pag. [33 Bll.] Priv. Pp. im Stile der Zeit (nach dem Originalen Einband). Einseitig radierte Blätter, mit hds. Paginierung. - Fleckig, fachmännisch neu aufgebunden u. restauriert. - Mit einem Inhaltsverzeichnis am Titel: Küsels Current, Unten gewölbte Current, Sächs. Current, Österr. Normal, Sächs. Kanzlei, Österr. Kanzlei, Schlangenkanzlei, Fractur Alphabeth, Druck- und altengl., Schattirte Fractur, Groß. Fract. Buchst., Latein mit röm. Ziffern, Engl. Rundhand., Italien u. Engl., Die Benennung, verschiedene Schrft u.a. - Nicht nachweisbar (kvk). 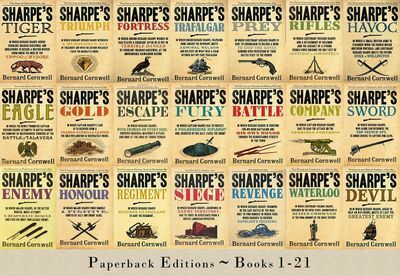 Sharpe's Tiger: Siege of Seringapatam in India in September 1803Sharpe's Triumph: The Battle of Assaye, September 1803Sharpe's Fortress: Siege of Gawilghur, December 1803Sharpe's Trafalgar: The Battle of Trafalgar, 21 October, 1805Sharpe's Prey: The Expedition to Denmark, 1807Sharpe's Rifles: Richard Sharpe and the French Invasion of Galicia, January 1809Sharpe's Havoc: Richard Sharpe and the Campaign in Northern Portugal, Spring 1809Sharpe's Eagle: Richard Sharpe and the Talavera Campaign July 1809Sharpe's Gold: Richard Sharpe and the Destruction of Almeida, August 1810Sharpe's Escape: The Bussaco Campaign, 1810Sharpe's Fury: The Battle of Barrosa, March 1811Sharpe's Battle: The Battle of Fuentes de Onoro, May 1811Sharpe's Company: Richard Sharpe and the Siege of Badajoz, January to April 1812Sharpe's Sword: Richard Sharpe and the Salamanca Campaign, June and July 1812Sharpe's EnemySharpe's Honor: Richard Sharpe and the Vitoria Campaign, February to June, 1813Sharpe's Regiment: Richard Sharpe and the Invasion of France, June to November 1813Sharpe's SiegeSharpe's Revenge: Richard Sharpe and the Peace of 1814WaterlooSharpe's Devil: Richard Sharpe and the Emperor, 1820-1821 . New. T. Cadell, W. Davies et al. Hardcover. straight-grained calf with gilt borders, four raised bands, red morocco title panels, black morocco volume number panels, gilt decorations between, plain endpapers with owner's bookplate (Frederick Smith) to each pastedown, fold-out maps in volumes 1 and 2, volume 5 chipped top of spine, all hinges tight but flyleaf separated from pastedown in most cases, spines scuffed, especially volume 8 . Good. 1820. 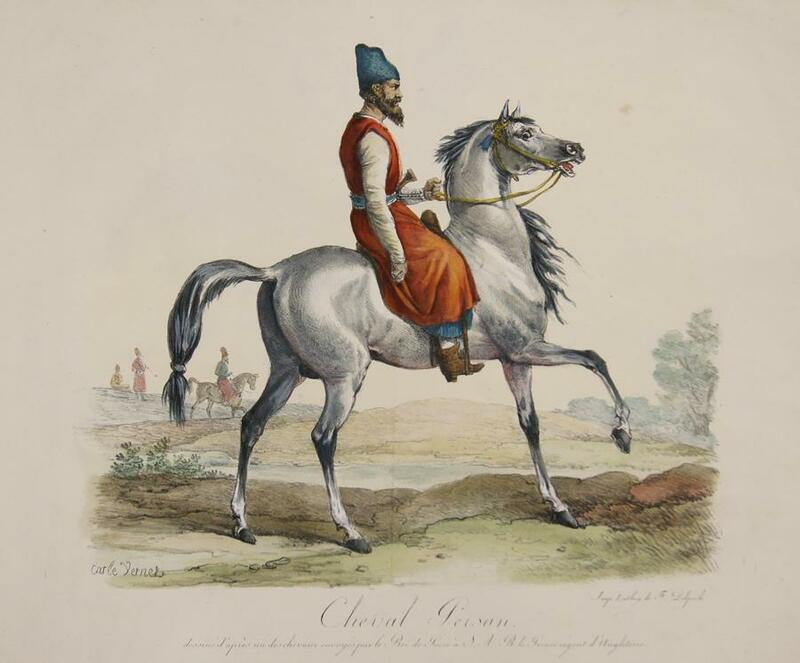 Artist: Vernet Antoine Charles Horace ( Carl) ca ; issued in: Paris; date: ca1820 - - technic: Lithography; - colorit: colored; - condition: Perfect condition; - size (in cm): 38 x 42; - description: Decorative representation of an arabian horse. The Arabian or Arab horse is a breed of horse that originated on the Arabian Peninsula. With a distinctive head shape and high tail carriage, the Arabian is one of the most easily recognizable horse breeds in the world. ; - vita of the artist: Vernet drew horse with the forms he had learnt from nature in stables and riding-schools. His hunting-pieces, races, landscapes, and work as a lithographer were also very popular. 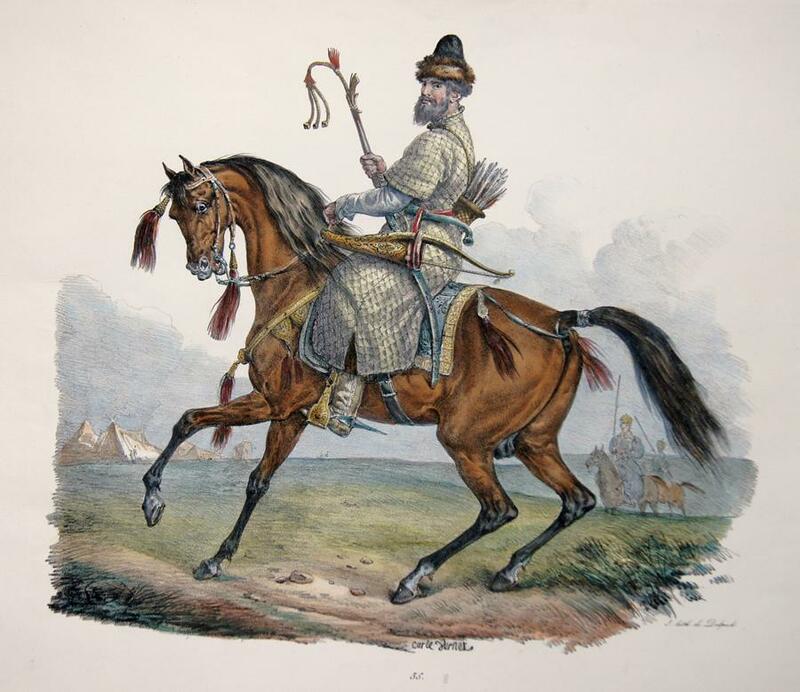 In addition to being a painter and lithographer, Carle Vernet was an avid horseman. Just days before his death at the age of seventy-eight, he was seen racing as if he were a sprightly young man. Teilansicht, Burgruine, "Ruinen von Tharandt". The Miscellaneous Poems. In Four Volumes; [Together with] Yarrow Revisited, and Other Poems. emotion recollected in tranquillity". 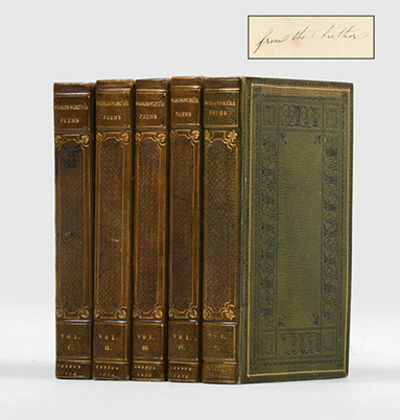 Complete sets of the Miscellaneous Poems are scarce enough, but to have a fully inscribed presentation set is a great rarity. The last authorially inscribed copy we can trace at auction was inscribed in only one volume, and appeared at Anderson Galleries in 1932. 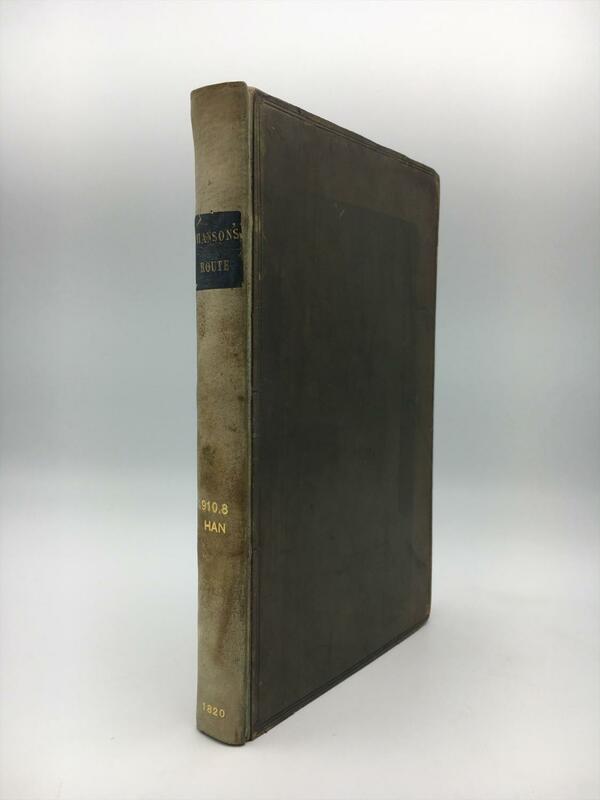 The only other copy we can trace thus inscribed by Wordsworth in each volume was to his daughter Dora, and appeared at Anderson Galleries in 1909. That the only other copy we can find thus inscribed was to his daughter shows something of the close friendship shared by Wordsworth and Kenyon. 74 Blatt. Halbleder der Zeit mit aufgezogenem orig. Broschurumschlagdeckel (berieben und bestoßen, teils, die Kanten stark, beschabt, die Kapitale mit Fehlstellen, das Titelblatt mit Quetschfalte, die Innengelenke angebrochen, etwas, vor allem die Ränder der Karten, stockfleckig, vier Karten mit unterlegten Randrissen, sonst ordentliches Exemplar) Quer-4. Erste vollständige Ausgabe des legendären Atlas, wie stets in Plano. Es fehlen die in diesem Exemplar wohl nie eingebundenen Karten 30, 31 und 38 B, dafür ist die Karte 40 zwei Versionen vorhanden (1820 & 1828). - Vgl. Espenhorst AS 66ff und PP I, 224ff [jeweils ausführlich]. New Britain. 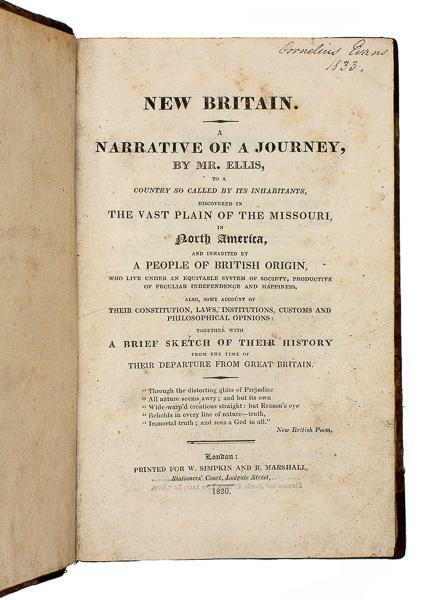 A narrative of a journey, By Mr. Ellis, to a country so called by its inhabitants, discovered in the vast plain of the Missouri, in North America, and inhabited by a people of British origin, who live under an equitable system of society, productive of peculiar independence and happiness. Also, some account of their constitution, laws, institutions, customs and philosophical opinions: together with a brief sketch of their history from the time of their departure from Great Britain. \"Das Schloss Hohenzollern aufgenommen bey der Capelle Maria Zell\". Weiter Blick auf die Burg mit der Kapelle im Vordergrund.